1 ml of jetPEI® is sufficient to perform up to 2000 transfections in 96-well plates. jetPEI® transfection reagent is a linear polyethylenimine derivative, free of components of animal origin, providing highly effective and reproducible gene delivery to adherent and suspension cells. jetPEI® transfection reagent is therefore particularly well suited for automated or manual HTS (High Throughput Screening) with three protocols available: reverse, batch and forward. In the forward protocol, the cells are split the day before transfection and the jetPEI®/DNA complexes are added to the adherent or suspension cells. The reverse protocol is the most appropriate when transfecting a pool of genes, such as a DNA library (Fig. 1). In this protocol, the jetPEI®/DNA complexes are prepared or deposited in the wells prior to addition of the cells. Complexes are stable for up to 4 hours (Fig. 2). The batch protocol has been developed to prepare a homogeneous pool of transfected cells. For this purpose, the cells are transfected just after trypsinization, while still in suspension. This protocol is preferred for drug screening applications and allows rapid processing, one day faster than the forward protocol. Fig. 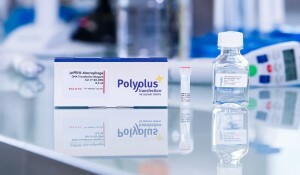 1: jetPEI® reverse transfection protocol for HTS application. Complexes formed with the water-soluble polymer jetPEI® and DNA allow efficient transfection for up to 4 hours, in contrast to lipid-based reagents and calcium phosphate. Thus they allow plenty of time to dispense the complexes into the plates (Fig. 2). Fig. 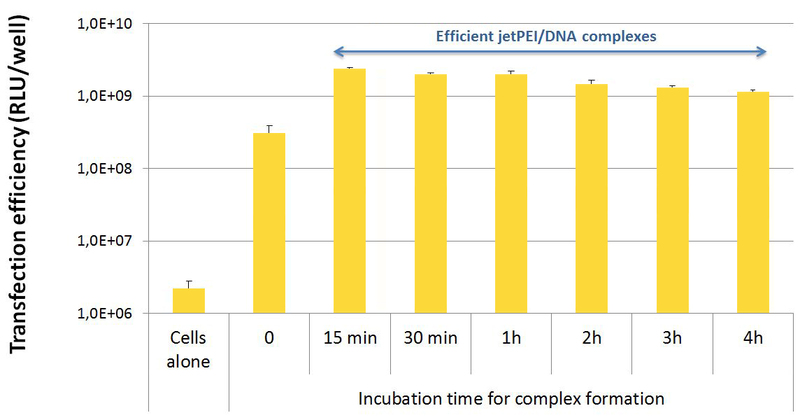 2: Effect of complex formation incubation time on transfection efficiency with jetPEI®. HEK-293 cells were transfected in 96-well plates with pCMVLuc and jetPEI® following the reverse transfection protocol. Luciferase activity was measured after 24 h.
HTS DNA transfection using jetPEI® gives highly consistent transfection efficiency from batch-to-batch (Fig. 3). Fig. 3: Batch-to-batch reproducibility using jetPEI®. For each lot, HeLa cells were transfected in triplicate in the presence of serum using the standard protocol for a 24-well plate. jetPEI® successfully delivers genes to various adherent and non-adherent cell lines, as well as primary cells (Table 1). 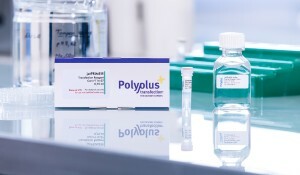 Over 550 publications using jetPEI® can be found in the Polyplus-transfection Database. In addition, our online Database gives specific transfection conditions for over 400 cell lines and primary cells. 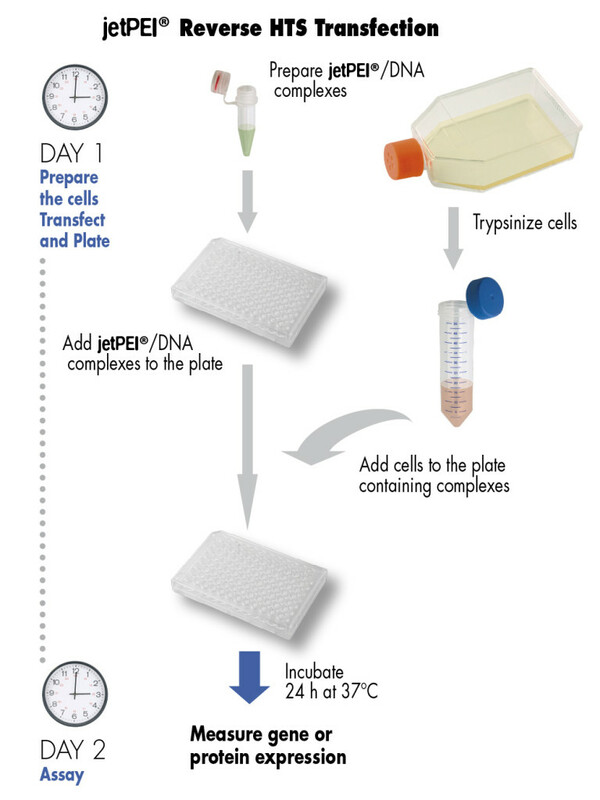 Table 1: Some common cell lines and primary cells successfully transfected using jetPEI®. jetPEI® was compared to several other popular transfection reagents (Fig. 4). jetPEI® was found to offer the best performance: high efficiency and low variability (small standard deviation). Fig. 4: Transfection efficiency of a series of commercial reagents. 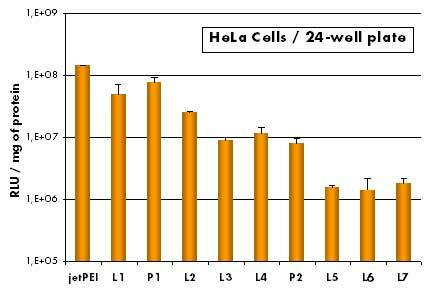 HeLa cells were transfected in 24-well plates in the presence of 10% serum, using 1 µg pCMV-luciferase according to the manufacturers’ protocols. Luciferase expression was measured 24 h after transfection. 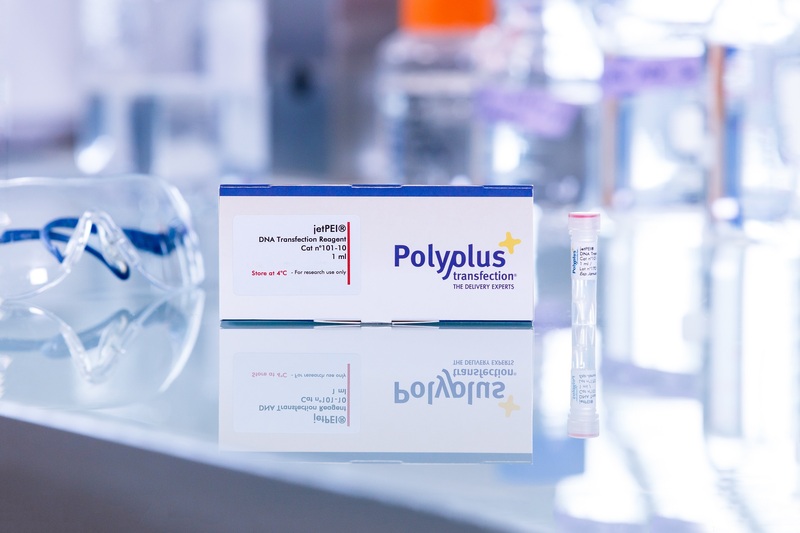 If you have any questions regarding jetPEI®, please visit our dedicated Frequently asked questions or contact us at support@polyplus-transfection.com. 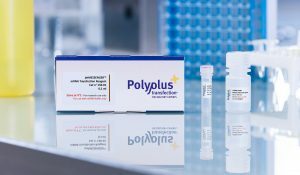 Our jetPEI® reagent is perfectly well suited for plasmid DNA transfection, especially for High-Troughput Screening (HTS) application. Here is a selection of relevant references using jetPEI®, more are available in our Polyplus-transfection Database. Elkan-Miller, T., Ulitsky, I., Hertzano, R., Rudnicki, A., Dror, A. A., Lenz, D. R., Elkon, R., Irmler, M., Beckers, J., Shamir, R., Avraham, K. B. (2011). Integration of Transcriptomics, Proteomics, and MicroRNA Analyses Reveals Novel MicroRNA Regulation of Targets in the Mammalian Inner Ear., PLoS One 6, e1819. Gerlo, S., Haegeman, G., Vanden Berghe, W. (2008). Transcriptional regulation of autocrine IL-6 expression in multiple myeloma cells., Cell Signal 20, 1489. Melkman-Zehavi, T., Oren, R., Kredo-Russo, S., Shapira, T., Mandelbaum, A. D., Rivkin, N., Nir, T., Lennox, K. A., Behlke, M. A., Dor, Y., Hornstein, E. (2011). miRNAs control insulin content in pancreatic beta-cells via downregulation of transcriptional repressors., EMBO J 30, 835-4. Rogowski, K., van Dijk, J., Magiera, M. M., Bosc, C., Deloulme, J. C., Bosson, A., Peris, L., Gold, N. D., Lacroix, B., Grau, M. B., Bec, N., Larroque, C., Desagher, S., Holzer, M., Andrieux, A., Moutin, M. J., Janke, C. (2010). A family of protein-deglutamylating enzymes associated with neurodegeneration., Cell 143, 564-7. Zhao, L. J., Kuppuswamy, M., Vijayalingam, S., Chinnadurai, G. (2009). Interaction of ZEB and histone deacetylase with the PLDLS-binding cleft region of monomeric C-terminal binding protein 2., BMC Mol Biol 10, 89. Every batch of jetPEI® is tested in-house by DNA transfection of HeLa cells. Transfection with a firefly Luciferase gene under the control of CMV promoter gives at least 109 RLU (relative light unit)/mg of protein. The value for each batch is indicated on the Certificate of Analysis.